Update: Problem solved! I posted a question on Blogger Help and got a quick response. Apparently the commenting is linked to cookies (and not the yummy chocolate kind!). Seeing as none of that stuff makes sense to me, I asked my husband to take a look and he fixed it. I'm not sure what is going on, but I can't seem to comment on Blogger blogs lately. If the comment form opens in a new window, off to the left, my Google Accounts info is there and my comment will publish no problem. But if the comment form is at the bottom of all the other comments, mine won't publish. My Google Accounts info doesn't show up even when I click to comment using a Google account and it never asks me to sign in (I'm already signed in!). The comment simply vanishes when I click publish. Has anyone ever had this problem before? Do you know how I can fix it? I want to be able to comment, especially with the It's For the Birds blog hop starting next week. I love making baby quilts. There's something so special about a quilt made to celebrate the birth of a new baby. Judging by how many patterns I see for baby quilts, not to mention all the blog posts about them, I'm willing to bet I'm not the only one who feels that way. These are the quilts I made for my own three boys. In typical fashion, Aiden's quilt was finished before he was born. Zachary's quilt was well underway when he was born, but was not finished until he was almost 8 months old. Nathan's quilt wasn't even started until he was almost 2 years old, and wasn't finished until he was 3! What Jesus said makes no sense because Nicodemus is thinking only of the physical. Physical birth is, after all, an ordinary thing. Babies are born every day, but they can only be born once. 'Born again' isn't something Nicodemus has heard of before. Spiritual birth, then, is what Jesus means by 'born again.' We all have a physical birth, when our bodies are born and we live on the earth. But to see, and the enter, the kingdom of God, we must experience the spiritual birth. How does this spiritual birth happen? Jesus, the creator of the world, came to the world, but the people didn't recognize Him. Most of them didn't care who He was. But to those who did realize, to those who believed, to them He gave a spiritual birth into the family and the kingdom of God. That spiritual birth is still available today. Jesus said, "For God so loved the world that he gave his one and only Son, that whoever believes in him shall not perish but have eternal life. "(John 3:16) Whoever believes. In Bible times...in the 1800s...today and on into the future, anyone who believes that Jesus died to take the punishment for their sins will be born again, spiritually, into eternal life. Have the angels in heaven rejoiced over your spiritual birth? I spent Monday evening working on block 17 for my Golden Album Quilt, but I don't have a finished block to show you. It didn't go well. This is supposed to be the corner unit. The straight edge along the left side looks good, but there's no way the top should look like that! I spent a good 20 minutes trying to figure out the problem, but it just didn't make sense. I was out sewing with friends, so two of them tried to help, but they couldn't see what was wrong either. Aargh! I came home and showed it to my husband, then we looked on Jinny Beyer's site to see if maybe a template had been printed wrong in the book, but there was no mention of a problem. So I sat and looked at it for another few minutes. The two pieces on either side of the diamond pieces are templates D and D reversed for the right hand diamond and E and E reversed for the left hand diamond. I remembered that the book said to be careful with those pieces, especially the D pieces, because they look symmetrical, but they're not. I took apart one of each of the D and E units, then put the them beside each other, switching the pieces, and VOILA! They're not sewn back together yet, but at least they look like they will fit! I have three more sets of D and E units to take apart and then I can try putting it all back together again. I don't like ripping out seams, but I have discovered I really don't like staring at pieces that won't go together and not being able to see the problem. Knowing what needs to be done is a much nicer feeling. On a happier note - a friend and I went to a new-to-me fabric store yesterday. I just love being surrounded by all that beautiful fabric. I practiced restraint and didn't buy one of everything in sight! I did pick up a few small pieces, all of which have been washed already and will be soon become hexagon flowers. I love these batiks - and I've already cut into two of them for hexies. The tan one may also work for future Sugar Block Club blocks. These three were just so beautiful and I thought they'd make great flowers. Since this will be a scrappy style quilt, any colour will work, especially once they're separated by the dark blue hexagons I'm planning to use. I don't have many whites in my stash. Actually, I think I'm down to pretty much none except for a few tiny scraps. These two serve two purposes. They will make great flowers. I'm also cutting fabrics for a future quilt that uses 800+ HST units in lights and darks. I have no problem with all the darks, but my stack of cut squares in lights is pretty pathetic. Now I can cut a bunch out of each of these and feel like I'm making a little progress at least. I'm linking up with Freshly Pieced again, and with Let's Get Acquainted at Quiet Play. Imagine you have blocks made and assembled into a quilt top center, but you still need to figure out the border. You decide a singe, wide blue border would perfectly frame the center you have pieced. Of course, that's not the end of the decision-making. Because there are so many amazing fabrics available, 'blue' just begins to narrow down the possibilities. There are light blues, dark blues, medium blues, green-blues and purple-blues. There are floral prints, geometric prints, solids, marbled and ombre. Prints can be large-scale or small-scale, tone-on-tone or multi-coloured. These are only the blues available in my 1 1/2" scrap bag! A trip to the fabric store can set your head to spinning as you try to figure out which fabric suits your quilt best. It's so much fun laying fabrics by the quilt, seeing which one is too light or too dark, too busy or too bland. Then the joy of finding the 'just right' fabric, the one that makes the rest of the quilt feel complete. Just as there is a myriad of different blue fabrics, so there is a myriad of different people. God made some of us musicians, some excellent cooks, some detail-oriented and some who love to visit seniors or the sick. In 1 Corinthians, Paul writes, "Now you are the body of Christ, and each one of you is a part of it. And in the church God has appointed first of all apostles, second prophets, third teachers, then workers of miracles, also those having gifts of healing, those able to help others, those with gifts of administration, and those speaking in different kinds of tongues." (1 Corinthians 12:27, 28) So, not everyone does the same thing well, and that is exactly the way God planned it. After listing all those possible roles, Paul continues, "Are all apostles? Are all prophets? Are all teachers? Do all work miracles? Do all have gifts of healing? Do all speak in tongues? Do all interpret?" (vv 29, 30) The implied answer is Of course not! What would the world be like if everyone had the same talents? Without pastors, our churches would lack the teaching of God's word. Without those who are good with numbers, our finances would be in a shambles. Without those who love to visit others, many who can't leave their homes would spend their days in lonely isolation. Earlier in the same chapter, Paul also says, "There are different kinds of gifts, but the same Spirit. There are different kinds of service, but the same Lord. There are different kinds of working, but the same God works all of them in all men. "(vv 4-6) Note that Paul writes 'the same God works all of them in all men.' All men. Now, I take 'men' here to be the general, meaning mankind, not the specific, meaning males. In all of us, male or female, God is working through the special gifts and abilities He gave us. None are left out. None are without abilities given by God to be used for His purposes and glory. When I am trying to find a fabric to suit my quilt, I am limited to what I can find either in a local store or an online retailer. I may have to settle for something that isn't exactly what I had hoped to find. But when God created us, He was not limited in any way. He never has to settle, making do with a talent that isn't quite right. To each one of us, He gives the exact skills and abilities we need for the role He would have us fill. This doesn't mean we never have to work at improving our skills. Even when given the ability to play piano, a musician must practice and work hard to hone that craft. So it is for other talents God has given. Think about this - based on who you are and what you do well, what role might God be asking you to fill? Are you doing that? And remember, no one is left without a talent and a related kind of service. Last night I was in the mood to finish something. Unfortunately, all my current projects are big quilts, and I'm nowhere near finished any of them. So I started something new. And finished it! I've been wanting a thread catcher, but not one of the ones that hang off the table from a weighted pin cushion. I really wanted it to be portable, so I could use it when I'm sewing my hexagons while we're driving. Last night I found this fabulous tutorial for a small, adorable thread catcher, so I went with that. The instructions were easy to follow and the whole thing was super quick. Just what I needed. So I kept going with my two extras and now I have three almost identical thread catchers (only the white buttons are different). I already have plans for those two bonus ones, so they certainly won't go to waste. I'm linking up today to Sew at Home Mumm's TGIFF (Thank Goodness it's Finished Friday!). I finally got around to stitching my April block from Amy Gibson's Sugar Block Club, and I love it. After I sewed it and carried it up to where I'm storing all the blocks finished so far, I realized I had already used all three fabrics together in another of the blocks. I guess I really like that particular combination! Last night I spent an hour working on the FMQ for my scrappy log cabin quilt. I was feeling a little frustrated because the spirals still seem jerky rather than smooth, plus I kept making my lines too close together, and sometimes even crossing each other. There's still some eyelashing too, but better than some blocks have been. When I finished for the night, I spread it all out so I could look at the two blocks I finished. Then I noticed that the first spiral block I did was next to the ones I did last night. So, I do see improvement, even if I'm not yet where I want to be. That made me feel better, as does reminding myself that this is a practice quilt. The whole reason I need a practice quilt is that I am still learning, so I shouldn't be so hard on myself! I'm linking up at Freshly Pieced again today. I love quilt magazines and books. I love the pictures of quilts, the patterns and the amazing fabrics. I already own more patterns than I'll ever have time to make, but new magazines always capture my attention. Sometimes I pull out some of my old magazines so I can flip through them and remind myself of all the quilts I'm going to make someday, when I have time. A few years ago, my husband bought presents for all of us when he was out of town. Because he knows me so well, my present was this quilting book. He gave it to me saying, "You may already know everything in here." It is a beautiful, thick book with lots of pictures, so I couldn't wait to sit down with it. I used one of the patterns to make placemats for my mother and mother-in-law for Christmas that year. Quilting is a fantastic hobby, in part because I'll never know everything. There will always be designers coming up with new quilts. People will find solutions to common problems and others will think up faster ways to cut and piece traditional patterns. While I know how to thread my machine, sew a 1/4" seam and quilt by hand or machine, I certainly don't know it all yet. Like quilting, the Bible is so rich there will always be more for me to learn. I've read this Bible from cover to cover, but I didn't even come close to understanding all of it. Paul told Timothy to "Do [his] best to present [himself] to God as one approved, a workman who does not need to be ashamed and who correctly handles the word of truth." (2 Timothy 2:15) Correctly handling the word of truth requires more than listening to sermons and then repeating what you have heard. How can you know a pastor's interpretation of a verse is correct if you've never studied that verse on your own? There are times I read a familiar passage of Scripture and notice a new perspective or a phrase that adds to my understanding. For example, the story of Jesus using five loaves and two fish to feed a crowd of five thousand men, plus women and children, is certainly familiar. But one day I realized the young boy who offered his lunch was very selfless, which means someone (probably his mother!) taught him to share. That gave me a lot of encouragement as I worked on teaching my own boys the basics of sharing and caring about others. The psalmist wrote, "How sweet are your words to my taste, sweeter than honey to my mouth!" (Psalm 119:103) Even more than quilt magazines, the Bible is enlightening and encouraging. Unfortunately, the Bible doesn't come with sumptuous photographs to draw my eyes and it's often harder to understand then the average quilt pattern. Reading, and especially studying, takes more mental energy than does flipping through a magazine. That means I sometimes opt for the magazine, even when I've been neglecting my Bible reading. The writer of Hebrews wrote, "For the word of God is living and active. Sharper than any double-edged sword, it penetrates even to dividing soul and spirit, joints and marrow; it judges the thoughts and attitudes of the heart." (Hebrews 4:12) The more often I study the living word of God, the better I will know the nature of God and the better I will understand how to live as a Christian. Both are well worth my time and energy. I once heard Liz Curtis Higgs speak at a conference. She said she can't wait to dig into her Bible with the women in her study group. Curtis Higgs has sold millions of Bible study books designed to help women learn more about the women found in God's word. Yet, even tough she teaches others, she doesn't feel she knows all there is to know about the Bible. I love learning from quilt magazines and books. I'm sure you do too. I pray we would have a similar enthusiasm for God's word. 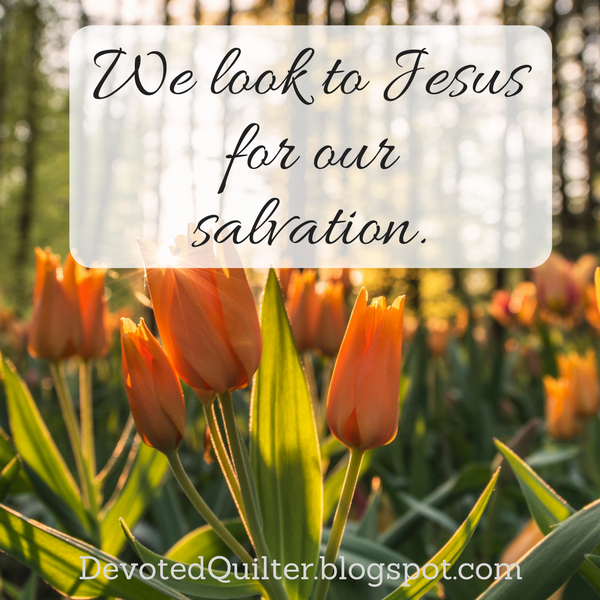 Patterns and tips will make us better quilters, but the Bible will make us better Christians. I have my fabrics picked out for my April Sugar Block Club block, and the foundations are cut, but that's as far as I've come. I haven't been doing a lot of sewing this week. Thanks to Dad and Terry (who introduced me to Terry Brooks' Sword of Shannara and Anne McCaffrey's Dragonriders of Pern), I have always loved fantasy books. I started reading Robert Jordan's Wheel of Time series in high school, about the time the third book came out. Now, finally, the last book is in my hands. And it's a BIG book! I have lots of reading still ahead of me! Tomorrow our church's kids group is taking more than a dozen kids to another church for a special event. We'll be driving an hour each way, so I plan to sew a couple of hexagon flowers together. I hope you get to sew and read a little this weekend. I finished block 16 of my Golden Album Quilt, by Jinny Beyer, Monday night. This block finishes at 10 1/8" and has 73 pieces. This quilt uses templates instead of rotary cutting the pieces, so it took a long time to cut out all 73. It really made me admire the women who had to cut all their quilt pieces this way. Me? I won't mind getting back to my rotary cutter! This block also has mitered corners for the border around the center. I've never mitered anything except my binding before, so this was new for me. It went fairly well, though the motif at the corner isn't perfectly matched up. The lines around the outside did match up though, so I didn't want to take it out and risk messing that up. This is the last block in this size. The last four blocks are larger, finishing at 13 7/8". I don't think any of them have so many pieces though! Last week I wrote about the wrong places some people look for the way to eternal life in Heaven. Today I want to look at the ways people look in the wrong places for their worth. How often do we judge our worth by what we do, and how well we do it? Whether it's our job, our volunteer activities, our children or our skills, we are looking to what we do to show us our significance and our worth. We don't consciously think, "I'm important because I'm a nurse," or "I'm a good person because my children are well behaved." Sometimes, though, we can feel that way without realizing it. Think of all the labels you can attach to yourself because of things you do. Now imagine all those things stripped away, so you no longer do them. The labels no longer apply. Do you have significance and value if you can no longer work, volunteer, quilt, discipline your children...or whatever your labels may have been? God created each and every one of us. That fact alone reveals a significance and value that can never be measured. I take great pride in all the quilts I have made, just because I made them. 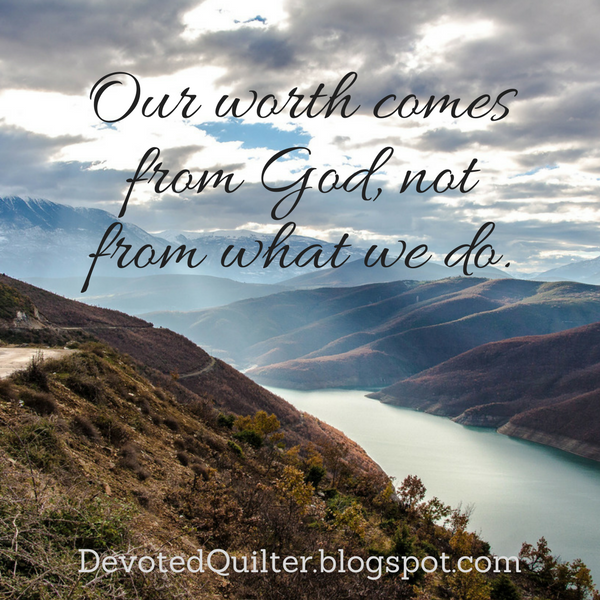 How much more does God take pride in each one of us because we are His handiwork? Not only did God create us, He considers us worthy of His focused attention! Think about it for a moment. He knows when you sit down, and when you stand up again, when you go out and when you lie down. Those are tiny details. I have a wonderful husband and three fantastic boys. I love them all. But I do not know every time they sit down or stand up. Even when I'm in the same room, I may not notice those details because they are so small. Yet God always notices those details about us. He pays such close attention that He knows everything about us. We've got it wrong if we're looking at what we do to give us significance and value. We have both simply because we exist - because God created us and cares deeply about us. I am so excited to be a part of two blog hops coming in May. First up is 'It's for the Birds,' from May 7th - 15th, then it will be 'Say it with Flowers,' from May 27th - 31st. Thank you to Mme Samm at Sew we Quilt for organizing the hops, and to Mary and Carol who will be cheering for us all. I can't share my project plans yet, but both are well underway. One will involve a zipper, which is new for me. I've never put a zipper in anything. Internet tutorials here I come! The other project will use this beautiful fabric. I'm going for a more modern look with this project, branching out a little from my usual traditional quilts. So far I'm pleased with how it's coming together. I can't wait for to get hopping! Well, I've been busy basting more hexagons for my flowers. I ran out of the templates I had printed before, so I went back to the same site and printed about a dozen more sheets. After cutting out 2 pages worth of these hexagons, and basting enough for a couple of flowers, I discovered these sheets printed out slightly smaller hexagons. As in 1/16th of an inch smaller. It doesn't sound like much, but it is enough. The yellow flower isn't actually sewn together yet, but you can see how it doesn't end up being the same size as the purple flower under it. That means they won't fit together if I try to sew them into the same quilt. Not good. I haven't figured out why these sheets printed smaller hexagons. I printed from the same source, on the same printer. In theory, that should have meant I got the same results, right? I did do another test sheet and got the smaller size again. So, I either have to find a new source for my templates, or continue on with the new, slightly smaller, size. Not sure what I'm going to do yet. On a brighter note, I sewed one two-tone flower the other day and I'm really pleased with the result. Since I know I want all my flowers to be different in the finished quilt, this gives me lots more options without needed a new fabric for every one. I've also decided I want the quilt to go on the wall in our bedroom, which gives me an approximate size to aim for. Approximate mostly because I haven't bothered to go measure that section of wall yet. I have lots of flowers to sew before I get to actually put them together in one unit! I'm linking up with WIP Wednesday at Freshly Pieced again. Take some time to check out all the amazing projects on the go. We've all had moments when we're looking for something. We know exactly where we left it, exactly where it should be, except it's not there. Well, early one morning Mary Magdalene, Joanna, Mary the mother of James, and the others with them (Luke 24:10) were having one of those moments. Can you picture the women standing around at the entrance to the tomb, 'wondering about this'? "Are you sure this is the right tomb?" "I'm sure it is...at least, I think it is." "Then where is his body?" "This can't be the right tomb. Maybe it was that one over there." They were looking in the wrong place! Not the wrong tomb - the wrong place altogether. They thought Jesus' body would be in the tomb, because that was where it was put, and dead bodies don't move themselves from place to place. But Jesus' body wasn't in the tomb, among the dead, because He was no longer dead. Many people are still looking in the wrong places. Some look to good behavior or good deeds to earn them a place in heaven. They hope that when the judgement day comes, God will declare them 'good enough' because they have donated enough money, served others enough, volunteered enough, loved well enough...Unfortunately, 'good enough' will never be good enough. Heaven is reserved for those who are righteous, which according to my dictionary means 'morally right.' I don't know about you, but no matter how good I try to be, I don't think my 'good enough' will equal God's 'morally right.' If you have ever told a lie or gossiped, you are not righteous, which means you are not good enough for heaven. Neither am I. By ourselves, by our own goodness, none of us would see heaven. That's why I find this passage from Romans absolutely amazing. Did you see the amazing part? Righteousness from God, given freely through faith in Jesus to all who believe. It doesn't matter, Paul says, which sins you have committed. There is no difference - all of us have sinned in one way or another, so we all fall short. But through faith in Jesus, anyone can receive righteousness from God. This is the heart of Easter. Jesus died and He was buried. But when the women went looking for His body, He wasn't there. They were looking in the wrong place. He was, and is, alive! And because He is alive, he offers each and every one of us His righteousness, if only we would believe. That's the only place we need look for our salvation and the only way into an eternity in heaven with Him.